For the nine years I danced in Montreal’s Les Grands Ballets Canadiens I performed The Nutcracker so many times — from mid-December to early January every year — that the ballet has become synonymous with Christmas. Even thirty years later the association is so specific that it’s enough for me to hear a few notes of Tchaikovsky’s score to be immersed once again not so much in seasonal celebrations but in the sensory atmosphere of the theatre at that time of year. Les Grands Ballets Canadiens’ production by Fernand Nault was a colourful retelling of the E.T.A. Hoffman story with lots of children in the first act playing themselves at the Stahlbaum Christmas party and even more playing mice in the ensuing battle with the toy soldiers. The company dancers played elegant, but far too young parents in Act I before the women rushed off to change for the Snow scene while the men fought on against the mice; we were all back for the divertissements in Act II. The memory of that particular production is so engraved on my mind that it has been difficult to watch another Nutcracker with any objectivity. 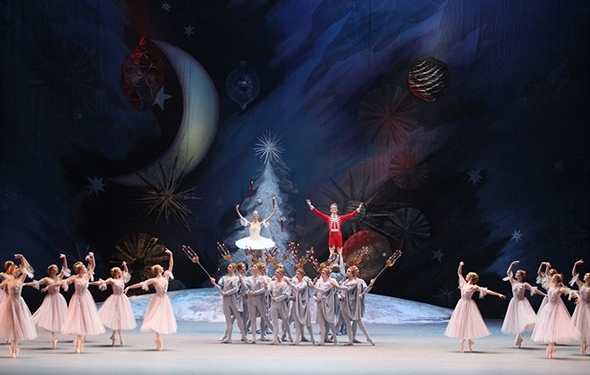 Many productions present The Nutcracker as a ‘fun-for-all-the-family’ entertainment, an association that has given Tchaikovsky’s score, despite itself, a false superficiality. The invitation to see the live streaming of Yuri Grigorovich’s 1966 version for the Bolshoi Ballet has broken that spell. The performance was broadcast live on December 23, with a reprise the following week. Directed by Isabelle Julien for Pathé Live, it gives you in effect ‘the best seat in the house’ while also offering glimpses of the dancers warming up on stage before the curtain. In the intermission Katia Novikova interviews the great ballerina Ludmila Semenyaka about Grigorovich’s vision for The Nutcracker and the role of Marie she once danced; she talks with her eyes and hands as if the wonder of discovery is forever embodied. Grigorovich’s staging interprets the narrative as Marie’s journey from childhood to adulthood. As explained in Novikova’s introduction, Tchaikovsky’s music for The Nutcracker was influenced by the death of his beloved sister Sasha; it has been suggested that the character of Marie came to embody his feelings towards his sister. Grigorovich’s treatment restores the score, played here by the Bolshoi orchestra under the baton of Pavel Klinichev, to a sense of self-worth without betraying the spirit of Marius Petipa’s exacting storyline. The principal characters — Margarita Shrainer as Marie, Semyon Chudin as the Nutcracker and Denis Savin as Drosselmeyer — weave in and out of the two acts as characters whose paths are integral to the entire story rather than as observers or instigators of their own entertainment. At the same time Shrainer’s identity as Marie in both acts lends a sophisticated choreographic continuity between them in which her sense of youthful anticipation and fulfillment is entirely believable. Chudin has a younger alter-ego as the Nutcracker — unfortunately unattributed in the program — whose diminutive, articulate body is played with, fought over, damaged and repaired before giving his life for Marie in the battle against the Mouse King (Alexander Vodopetov) and his army of mice. It is only after seeing the guests depart ‘outside’ the house that we return inside to see the limp body of the Nutcracker under the tree slowly awaken as the Prince. The simplicity and gravitas of this transformation both in the music and the choreography matches the sublime yet deceptively simple opening of the grand pas de deux in the second act; both are moments that indicate clearly this is no longer a children’s ballet but a sophisticated paean to youthful metamorphosis. 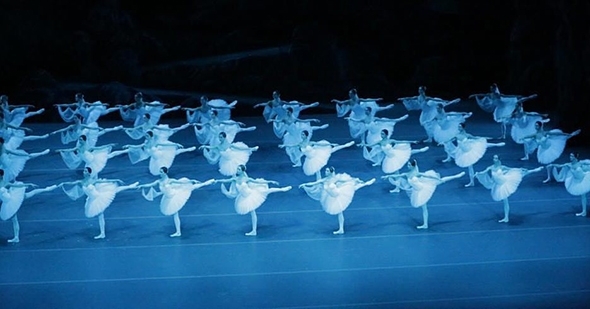 The national dances Petipa had sketched as divertissements become in Grigorovich’s scheme a metaphor for the richness of cross-cultural exchange. Grigorovich’s collaborator, the late Simon Virsaladze, was responsible for the original designs of both set and costumes. He plays with the sense of scale, using the grand Stahlbaum home as a visual reference from which the environment in subsequent scenes grows ever larger as part of a psychological framework rather than a purely visual one; his sense of colour and period costume creates a unity with Grigorovich’s choreography and Tchaikovsky’s score. The abundant energy of the performance and one or two suggestions of nervous effort may have been because Grigorovich was reportedly in the audience that night. For the 610th performance of a work he created 52 years ago, it retains its freshness and appeal but more importantly recalibrates the drama of Tchaikovsky’s score in relation to Petipa’s synopsis.